Q. What is a dust mite cover? A. 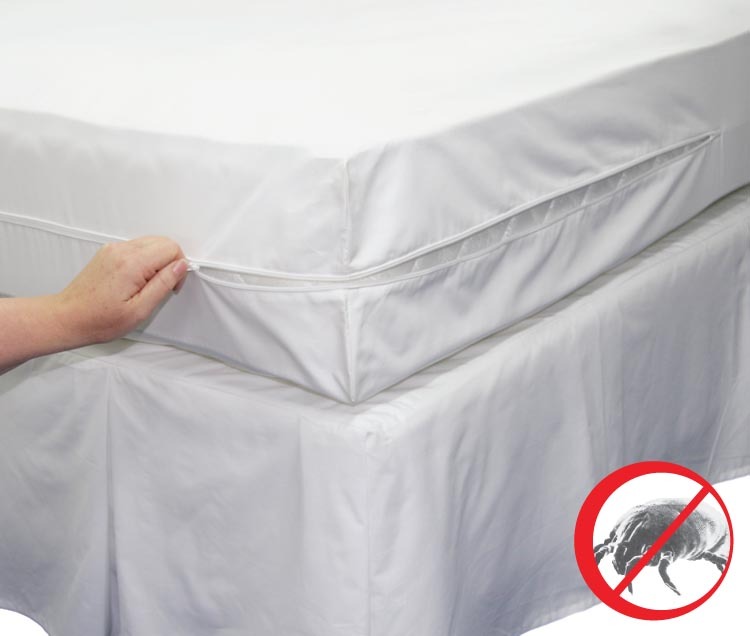 Dust mite covers completely encase the mattress, pillow and quilt on all sides to stop dust mites and mite faeces (allergens) from entering or exiting the bedding. The covers zip up and the special fabric blocks mites and allergens. The covers are hot washable as mites may survive cold washing. Dust mite covers are sometimes called encasements or dust mite encasings. Q. Should bed linen be placed over the AllergEnd Plus covers? A. Yes, place normal linen over the top of the AllergEnd Plus protective covers on the mattress, pillow and quilt. Wash normal bed linen at least once a week. DermaSheets may also be used over the AllergEnd Plus covers. Q. Why are my covers so large when new out of the packet? A. The AllergEnd Plus covers are designed to shrink and as such are manufactured deliberately large to account for this. All the sizes published are after the shrinkage has taken place which mostly occurs after the first hot wash and tumble dry. The great majority of the shrinkage is achieved when tumble dried after washing. Please be aware that the full shrinkage may not always be achieved and a slightly large cover in no way effects the allergen barrier performance or comfort. Q. Should the covers be washed before fitting the first time? A. It is a personal preference whether you wash the covers first. Please be sure to measure the mattress, pillow and quilt prior to purchasing to ensure that the covers fit before washing. They cannot be returned or exchanged after washing. Q. How often do the AllergEnd Plus covers need washing? A. Our AllergEnd Plus covers need hot washing @ 60 degrees every 8-12 weeks. They can also be tumble dried if required. In the case of the EasyCare system the EasyCare fitted sheet should be washed with the quilt and pillow covers every 8-12 week but mattress cover only needs washing every year. Q. How long do the AllergEnd Plus covers last? A. Replacement should be considered after about 10 years or more. Q. What does the Four Year Warranty cover? A. Our four-year warranty covers faulty workmanship and materials. This includes fabric faults, zip failures and seams. It does not cover holes created by abuse, undue wear and tear or as a result of the fabric being unduly forced. Please be careful opening the packaging with sharp objects such as scissors or knives. In the unlikely event of a warranty claim, please contact us for instructions on how to have the product assessed. It is the customer's responsibility (and at the customer's cost) to return the item to us for assessment. We will then make a judgment regarding the validity of the claim and if the item should be replaced or repaired. A. The fabric technology is much the same, both products have a wicking property with channeled fibres to keep the user cool. DermaSheets has added advantages for sufferers of skin conditions in the form of a soil release, an antibacterial treatment and an extremely smooth fibres to limit skin irritation. Q. What happened to CoolSheets? A. As CoolSheets (no antimicrobial) and DermaSheets (with antimicrobial) were basically identical fabrics they have been merged into the one product - DermaSheets. Q. What is the anti-microbial used on DermaSheets? A. It is called Aegis Microbe Shield which is a special long lasting treatment that physically penetrates the bacterial cell wall on contact to safely and effectively kill bacteria. Q. What are DermaSheets made from? A. DermaSheets are made from a silky feel blend of mostly nylon with a small percentage of polyester. The benefit of man-made fibres is that they can be made in continuous lengths that do not contain loose picks or ends that can irritate the skin. They can also be made with micro-channels that provide the wicking property of the sheet, this technology provides the cooling property of the sheets. All orders are shipped from Melbourne, Australia. Orders placed before 1pm AEST are generally dispatched the same day for delivery within 1-2 business days to Australian cities. Regional areas may take 1-3 business days. Orders over $300 are delivered free. A flat rate of $15 per order is charged for orders under $300. Consider delivering to a business address if you are not likely to be home. If the order cannot be signed for at the delivery address a note will be left in the letter box and the order redirected to the local post office. It is the customer's responsibility to check if there are any customs duties or applicable local taxes when the goods arrive in your country, we will not be liable for these charges. If the order is not cleared by customs at the destination country, AllergEnd reserves the right to withhold the freight costs it incurred in shipping the items to your country and the cost to the have the order returned back to Australia. These costs can be substantial so it is in the customer's best interest to pay any applicable local taxes. Please make sure the you choose the correct size covers for your country as some countries standard sizes differ from Australia. If the cover is a little big it will still perform perfectly well, too small and it just won't go on! We can ship to most countries. Note. We do not ship to some international destinations.